I used to have google toolbar for Gmail notifications. And chrome form filling isn't as wonderful as it is in toolbar. Its sure a case of misscommunication betweev toolbar team and chrome developers. When there are thousand of things to take care of, such trivial things get left out. And when everyones mind is indulged in technical complications, no one notices this. I think this has been yhere for a while. 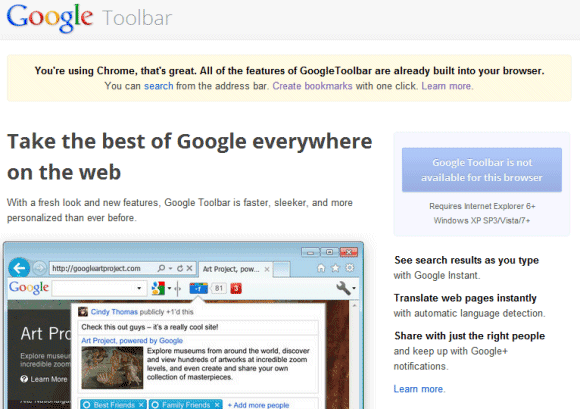 The inaccurate statement by Google is also a common misconception of others who never used Google Toolbar. They seem to think it was just about search. Also, I'm not sure that *all* GT features can be (or have been) provided via extensions - at least based on my perusing of the Google Chrome help forums. I am limping along with Google Share Button and Yet Another Google Bar Extension in the Chrome browser but it just ain't the same as the old Toolbar. I would pay money for a copy-cat Toolbar. You can use extensions in Firefox, as well, but that doesn't mean that the features are included in Firefox. That's like saying Chrome is built into Android because you can download it from Google Play (Android Market). Spelling correction via an online service is in the works and complete enough that there's a checkbox for it in the privacy options section of current Dev channel builds. I'm not sure how complete the rest of the implementation is. You can get everything you *need* from it by extensions. Period. and what about Web History? I can get searches from Web History whenever signed into Google, but (at the least the Firefox version) had the option to catalog every page I visited (whether or not it was from a prior search). I think there is an unofficial extension for that, but could have been a feature worth more exploration. My "browser" history works fine, but is tied to one machine (for the most part). I know I can Sync my account, but the WebHistory option from previous versions of the toolbar worked lots better. You forgot the translation by hovering over a word. Something I miss. The dictionary extension helps somewhat, but it's not the same. Why would Google say it's all there, while Google (you) are saying it's not? Come on Google, quit contradicting yourself. You lose a little bit of credibility with this. So you've read the post and concluded that it must be written by Google. It makes sense. Just so you know, this is a blog about Google, but it's not affiliated with Google. It's an unofficial blog. "Unofficial news and tips about Google"
I would say that google seems to be in a dumbing-down mode; somebody in the office must have said to start getting more users and cut down on costs. What this means is that they are now focused on appealing to the average joe or jane, the statistical average doesn't care about subtleties of search or of other fineries. That's why google is eliminating a lot of fine and useful services. Unfortunately google is estranging those who do care about subtleties and niche products, the very same people who are best suited to spreading the word, to educate, to talk about value...this new google direction is not good, a little bit sad,... short term thinking... I hope that I am exaggerating, but the signs seem to be pretty clear. Some of these chrome extensions are wonderful. Just wondering if they make it slow. Chrome is indeed the best browser I have used to far. Many features are available through extensions instead of being a part of chrome itself. I think if you consider this, chrome is much more powerful than any toolbar. Now I remember why I deleted Chrome last time - it doesn't support Google Bookmarks. My world is in that. It amazes me they don't support their own functionality in their browser. Back to IE. If you administer a google group - Google has launched a new Groups interface and will be forcing everyone over shortly. Unfortunately, all of the management tools for Google groups admins (invite members, moderate, settings, etc.) are all in the page's button bar. Unfortunately, the new Google Groups' interface button bar will not display in Google Chrome or in the newer Aurora (Google Chrome 2). It will work in Firefox, however. Note to Google: Don't roll out interfaces that only work on your competitor's platform - it's bad for business. Chrome is my favorite browser so how can I get all that tools in Chrome? Hi everyone. I was also frustrated by this problem with Chrome, so I created my own version of Google Toolbar (focusing on the search features) as a Chrome extension. It is called "SearchBar". I hope you like it. Google appears as a blank white page withGOOGLE outlined in light gray, I cannot open Chrome with the Google Chrome icon. Any suggestions? I have added Chrome again and again, now just Google appears! "Search in the current site" is http://www.google.com/search?q=%s%20site%3A%h . I'm feeling lucky is missing too, http://www.google.com/search?ie=UTF-8&oe=UTF-8&sourceid=navclient&gfns=1&q=%s . Highlighting the search terms on the page you're visiting and preserving the query in the search box and switching to other Google services are available in this extension: https://chrome.google.com/webstore/detail/fjefgkhmchopegjeicnblodnidbammed . Showing the PageRank of the page is available in this extension: https://chrome.google.com/webstore/detail/pagerank-status/ckkeaccoegfpigjcpnfgkopbgbcabomn . "Share" buttons are aviable in this extension: https://chrome.google.com/webstore/detail/ffpgijchhhkhnokafdeklpllijgnbche . Integration with Google Bookmarks is available in this extension: https://chrome.google.com/webstore/detail/aapfhogljejnbbgnfjchjgolfophodfi .